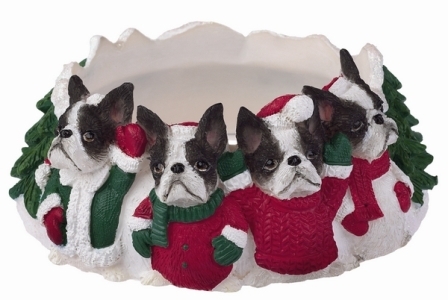 A cheerful collection of Boston Terrier Dog holiday giftss for your home that feature the Boston Terrier dog to brighen your holiday spirit. 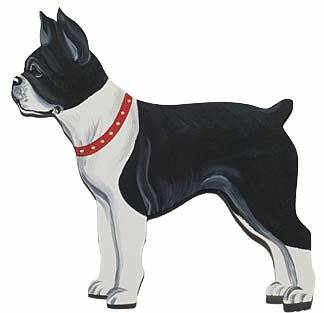 We have lovely stockings, christmas mugs, holiday mousepads, Boston Terrier holiday cards, tote bags, holiday neckties, holiday aprons and other items featuring the beloved Boston Terrier! 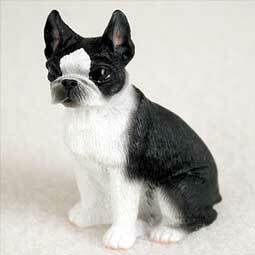 We also carry several Boston Terrier Dog Ornaments on another page to brighten your Christmas tree or to decorate with. 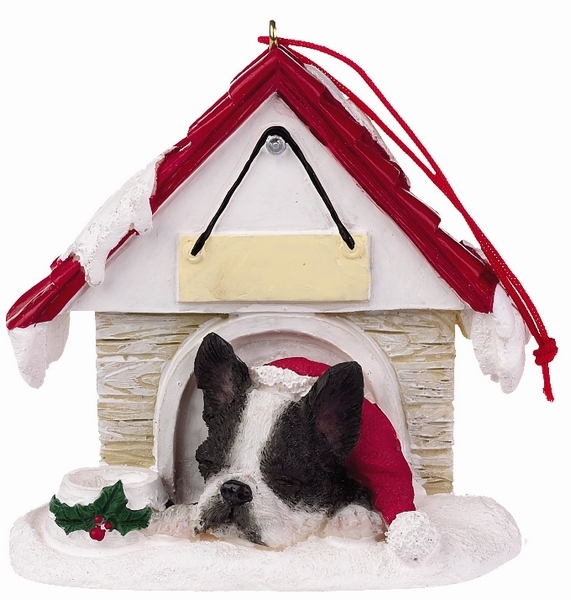 These Boston Terrier holiday decor items make great gifts for the Boston Terrier dog lover for the holidays! 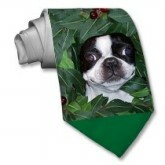 The Holly Jolly Boston Terrier Christmas Tie presents an excited Boston Terrier peaking through holly leaves. 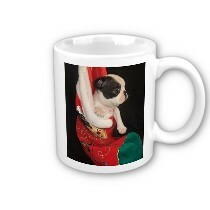 Makes a terrific Christmas Gift for the Boston Terrier Lover. Made of silky 100% polyester fabric 55" long, 4" wide (at widest point). 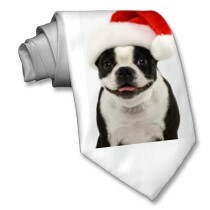 This jolly Boston Terrier Santa Necktie has a happy Boston Terrier dog with a Santa cap. 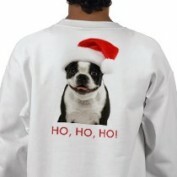 Makes a terrific Holiday Gift for the Boston Terrier Lover. Made of silky 100% polyester fabric 55" long, 4" wide (at widest point). 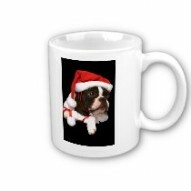 The Twinkling Lights Boston Santa Mug will brighten your Holidays with cheer as you celebrate with your Boston Terrier friend. This lovely holiday mug features a Boston Terrier Dog dressed in their Santa wuit all wrapped up in Christmas lights. 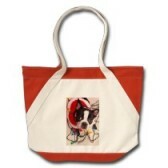 Makes a wonderful holiday Boston Terrier Lover gift.It's large handles make it easy to hold. This large 15 oz. Mug is dishwasher and microwave safe. It truly is a cup of good cheer for the holidays. Buy one for your Boston loving friend. 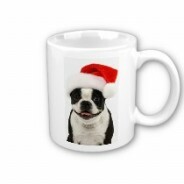 Our Boston Santa Hat Mug features the Boston Terrier dog with a Santa hat giving his big holiday smile right to you. 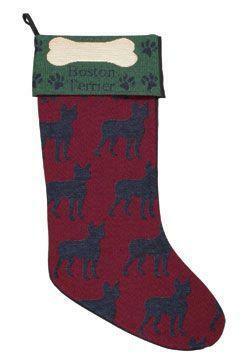 Makes a great holiday gift for Boston Terrier dog lovers. It's large handles make it easy to hold. This lovely 11oz. Mug is dishwasher and microwave safe. It truly is a cup of good cheer for the holidays. Buy one for your Boston loving friend. 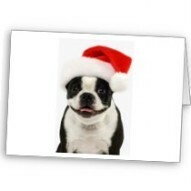 Enjoy greeting your loved ones with this smiling Boston Terrier dog in a Santa hat card. He will put a smile on their face and joy in their hearts. Buy some for your Boston loving friend. Comes in a package of 6. The Merry Christmas Boston Santa Apron is what smart cooks wear for the holidays. 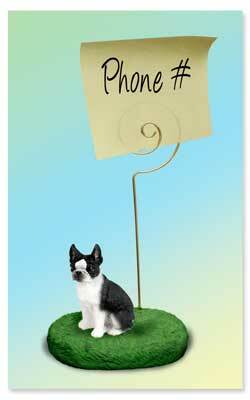 Makes a delightful gift for the holidays for any Boston Terrier dog lover. Stay clean while cooking with this medium length 35% cotton / 65% polyester blend twill apron. Three spacious utensil pockets to hold all you need. Machine washable. 24" L x 28" W. Made in the USA. 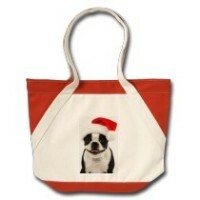 This cheerful Boston Terrier Santa Tote Bag will carry your Holiday goodies and send a joyful greeting at the same time. Brighten your Holidays with this lovely 100% cotton canvas tote with red accents! Colored red highlights on top and base. Zipper closure. Well constructed with double-stitched seams. Three colors available. Machine washable. 19"x15"x5.5" Perfect holiday gift. 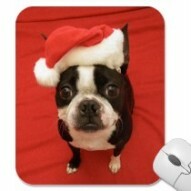 Small Red Reindeer Antlers for your Boston Terrier. Great for the Holiday season! Cute Santa Hat for your Dog. 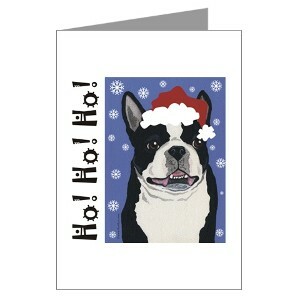 Will make you Boston Terrier the hit of the Christmas Party! 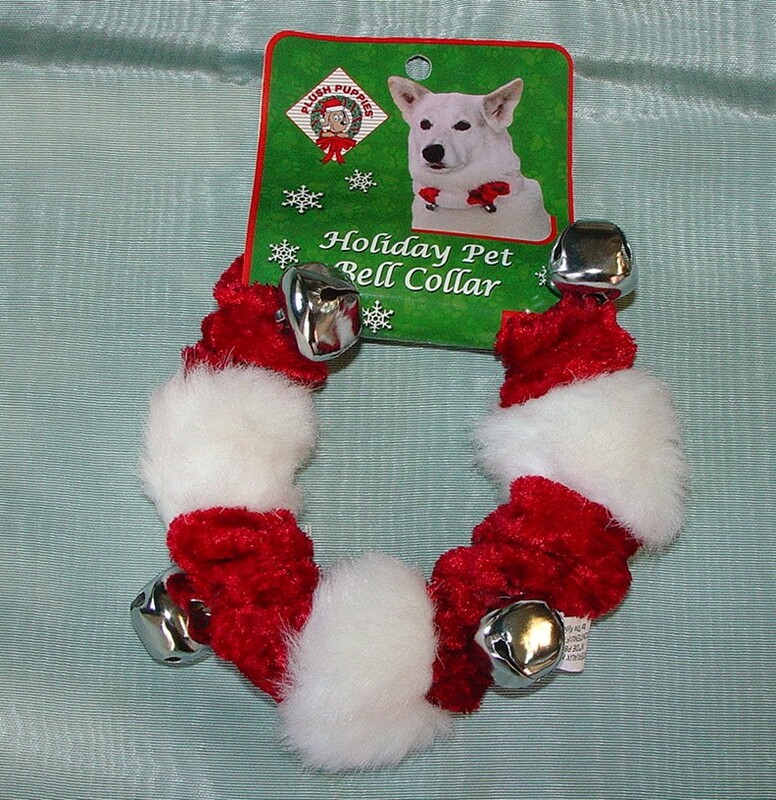 This Red and White Holiday Scrunchable Collar with Jingle Bells fits around your dog's neck and is adjustable. Perfect for Christmas! 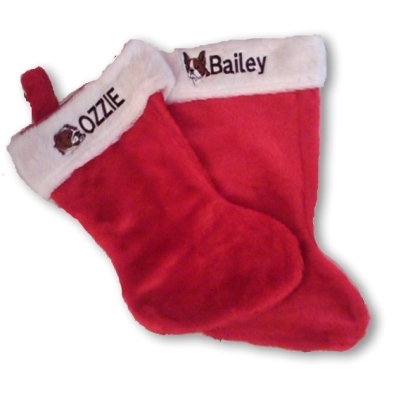 This Doggie Delight Stuffed Christmas Stocking is loaded with fun toys in festive holiday colors. Each 14" vinyl stocking with header card contains a 5 1/2" vinyl Snowman with squeaker, 9" Knotted Cotton Rope, a 2 1/2" Two-Tone Holiday Tennis Ball, and a 5 1/2" Berber Star with squeaker. Angel Halo Pet Headband. Large, Bright White Halo for the little angel begging food at your side. Show the world that when you say "Good Dog", you really mean it! Easy to put on and get off, Halo Headband stay in place with a soft elastic strap. Halo Headbands are designed for medium to large dogs and Size: 6 inches wide and 11 inches high. This eye-catching Aria Jeweled Christmas Tree Charm will add sparkle and spice to any dog’s collar. Distinctive charms are studded with rhinestones for a shimmering look. Each charm features a lobster claw clasp for secure attachment to collar, and an attractive header card for easy retail display. 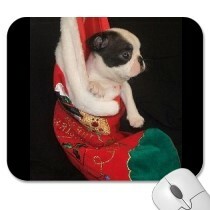 The SMALL Boston Terrier Dog Christmas Gift Basket is perfect for the Holiday giving. Filled with nice Boston Terrier items for your tree, your dog's Christmas and special holiday memories for the dog owner too! Comes in a red wicker basket that is wrapped and a red bow with a personalized note card attached. What a great way to show your holiday spirit. Our Jolly Boston Terrier Santa Ball Ornament will be the highlight of your Christmas tree! 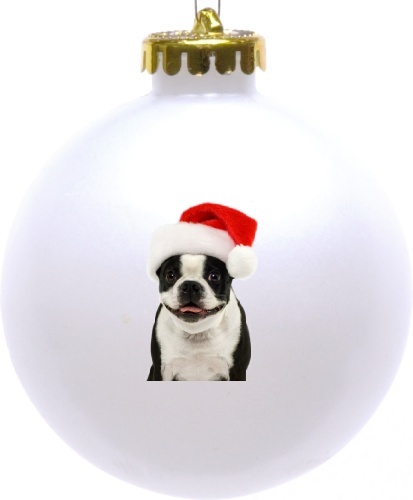 This lovely Boston terrier Ball on your tree to celebrate the holidays. 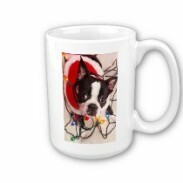 A truly wonderful Christmas gift for a Boston Terrier dog lover. Ornament comes in a festive white box with the words "Happy Holidays." 3.25" Diameter Ball, Boston Image is 1" x 1.5" This is a shatterproof ball holiday ornament that is durable & high quality. 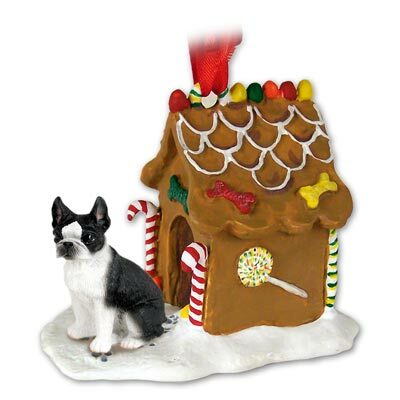 A cute Boston Terrier Ginger Bread House with our Tiny One Boston terrier figurine sitting in front of the door. Great for hanging on your Christmas tree as an ornament or take the ribbon off to place on a shelf. Wonderful gift for holiday giving. Hand painted stone resin and boxed. Size: Appx. 2 1/2" W x 3 1/2" L x 3 1/4" H Weight: Appx. 4 oz. Add a 18 ounce Premier Soy Jar Candle made by Trinity Candle.The jar candles are super scented, clean burning and great smelling from beginning to end. Candle is topped off with a golden bow. 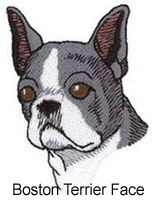 Your Boston Terrier Tiny One Angel Candle Topper will fit right on top. Available in 4 fragrances: Cherry Vanilla(pink color), Creamy Vanilla (white color), Black Cherry(pink color) or Cinnamon Swirl(red color). 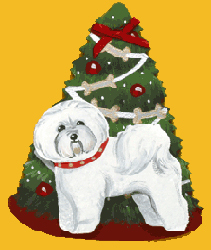 These Special Holiday Dog Collars and Leads are lovingly handcrafted in the U.S.A. with the highest quality materials. The cotton fabric cover helps keep pet fur from matting. Collars can be personalized (optional) with Names and/or Phone Number ($5 extra). The high-tensile strength webbing forms a strong inner core for both the collars and leads. The Boston in Winter Booties Card makes a wonderful greeting card or note card to the holiday season for use anytime in the winter. Pictured is a Boston Terrier in winter booties trying to lick the first snow flake. Card says "Season's Greetings" inside but can come as a plain notecard or with your greeting if you want. Just write us at linda@bostonterriergifts.com with instructions. 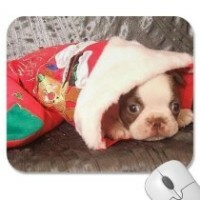 Charming and cute Boston Terrier Lovers will adore it. Printed on ultra-heavyweight (120 lb.) card stock with a gloss finish. Size: 5.6" x 4" Each card comes with a white envelope. 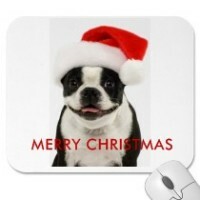 These adorable Boston Terrier Santa Round Stickers are great for special mailings, cards, scrap booking or anywhere you would like to stick them! Great for the holidays! 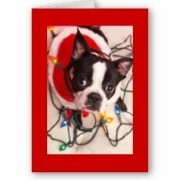 Adorable Boston Terrier in Christmas Lights Santa Square Stickers are great for special mailings, cards, scrap booking or anywhere you would like to stick them! Great for the holidays! 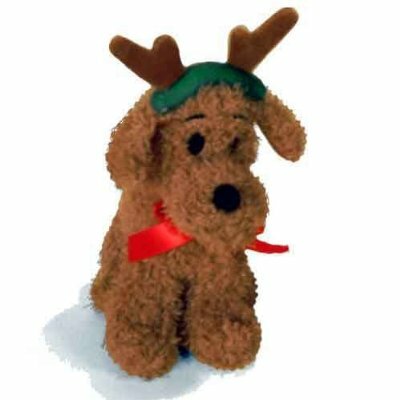 Wishing - Christmas Singing Dog with Antlers Plush Toy. 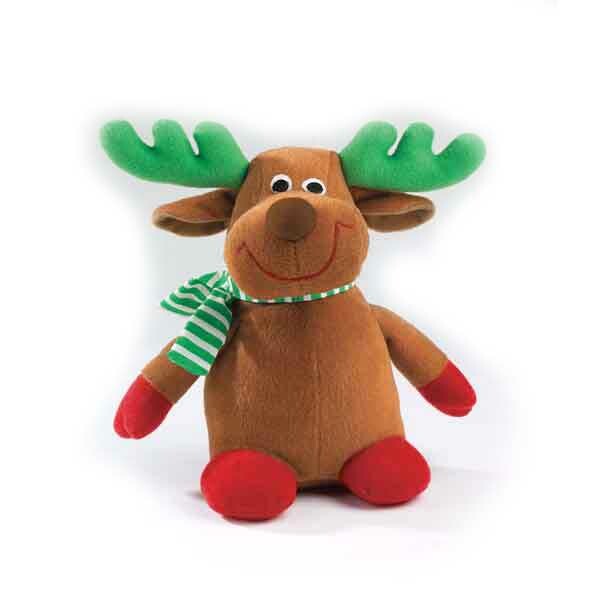 This Singing dog with antlers is sure to be a hit with your little one. Our traditional Plush Puppies toy line includes popular designs and characters made with a soft, traditional plush material in holiday colors. The Aria Sequin Santa Dog Hat will make your dog sparkle! Great for holiday parties and get-togethers. Made of well sown red sequins with a white pompom. It has an adjustable chin strap and plush trim and pompom. Each includes a hangtag. Size: Small 3 1/2" inches wide.